Dealing with a hospitalized parent can be overwhelming, especially when it happens suddenly. Here are important dos and don’ts put together by our experienced nursing and rehabilitation team at The Holiday. Preparing yourself in advance will reduce the confusion and stress, and help you advocate for your parent’s health. Essential documents to bring to the hospital: Health insurance documents, a medical power of attorney, HIPPA authorization, and any advance care directives are essential documents to bring with you to the hospital. This will enable you to make decisions on behalf of your sick loved one in the event they cannot do so. Talk to doctors and nurses attending to your parent: Speak with the attending physician and hospital staff about the procedure or treatment mom or dad is undergoing. You want to be sure they are receiving the best care, and that involves knowing their options. Ask about the benefits of the surgery and if there are any alternatives. Listen carefully to what doctors and nurses are saying. Take notes if you need to, and do not hesitate to ask questions to clarify what you do not understand. Go over their medical history with the hospital team: Do not assume that the surgeon or staff is aware of their latex allergy or intolerance to certain antibiotics. Also keep in mind that hospital stays tend to disorient many seniors. This may manifest as aggression, stubbornness, fear, etc. Talk to the medical team about any previous instances so that they know what to expect. Determine how the surgery will be paid for: Will Medicare cover the cost? Do they have supplemental insurance (including retiree coverage from a former employer) to pay for any out-of-pocket expenses (deductible)? Or will it come out of their savings? Typically, these are delicate but important questions to have before any emergency situation. However, if you are not aware of their healthcare coverage, you will have to find out at the time of hospitalization. Learn about the aftercare they require: Monitoring their health and following the prescribed aftercare schedule is critical to a quick recovery. 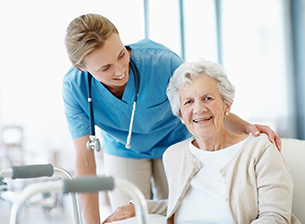 Familiarize yourself with their medication and care regimen, including any physical therapy and specific nutritional requirements to help them return to normalcy as soon as possible. Decide where your parent will live during the recovery process: This is an important decision, especially if your loved one is too frail to return home and stay alone. 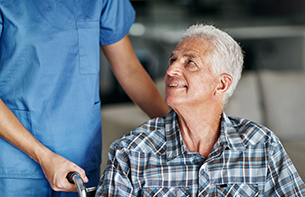 A skilled nursing and rehabilitation center might be ideal as accommodations are designed for patients with mobility issues; and they will have 24/7 monitoring and professional aftercare. It might also be a good time to consider moving them to a retirement home or assisted living facility where they will have the support and assistance they need along with the companionship of peers. At The Holiday retirement communities, we offer well-appointed accommodations and personalized care plans to meet the specific needs of each resident. Our high-quality services and rehabilitation facilities help seniors recover quickly and maintain an independent lifestyle for as long as possible. A wide range of activities keep our residents active and engaged. Round-the-clock supervision and the company of peers ensure they are never alone. You can count on our experienced and dedicated staff to look after mom or dad like their own family.